We already know from previous reports that Apple is working on a magnetic charging system for iOS devices, similar to the MagSafe connectors on its MacBooks. But one hurdle that stood in the company’s way was the MagSafe’s inability to transfer data. However, a newly published patent entitled “Programmable Magnetic Connectors” seems to confirm that Apple is making progress on a magnetic connector capable of transferring power and data, which could spell the end of its 30-pin dock connector and even the headphone jack. The patent, entitled “Programmable Magnetic Connectors,” was picked up by Apple Insider earlier this week. Apple explains that the disadvantage to its existing 30-pin dock connector and headphone jack is that they precent a device from being properly sealed. This is why Apple places liquid damage indicators in those ports. Furthermore, the male end of these connectors is left exposed when it’s not inside your device. However, a magnetic connector would allow Apple to seal the device, making it more difficult for moisture to penetrate through its ports. And not only would the system work for data and power transfer, but also as a replacement for the headphone jack. Apple’s solution is a new universal cable that features programmable magnets unique to each device. When you attach a cable, it would automatically recognize the device it’s hooked up to and “reconfigure itself accordingly,” the filing reads. In one embodiment, Apple details a headphone jack that is concealed within a plastic casing at the end of its cable. 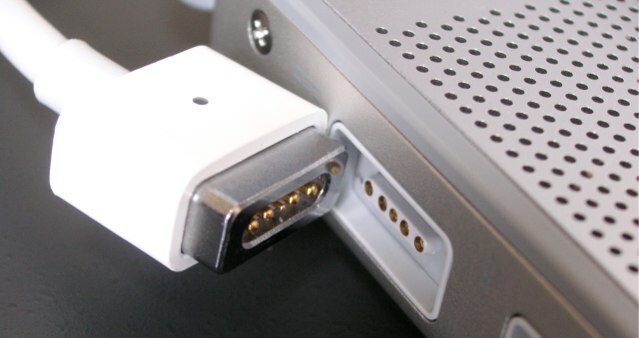 When the user attached it to their device, a magnet pulls the jack out of its housing and into your device. This is very exciting stuff for those who use iOS devices. As much as I love mine, I hate the 30-pin dock connector, and I’d much prefer a universal solution — especially if it’s got magnetic powers.